In his basement he paced, his anger smoldering. It was the third night this week. She seemed to care less and less. She was getting a little more careless by the day. Her sister was the problem; always encouraging her. Thirteen steps from one side of the basement to the other. The others were in on it, too. Ernie at work. Why else would he crack a joke about her looking tired at work? “Had a little too much fun time last night?” Fun time? What did that mean? And why did he wink? He’s in on it. And Carl too, that little jerk. He would get them all. His vision was going dark around the edges. The headache was coming on, worse this time. He could see his pulse through his eyes, little rapid flashes matching his heart rate. The gun and ammo were in the back of the cabinet and he could feel their warmth. Their heat would cool his anger. Tonight he would not sit home and wait. Tonight he would put an end to this once and for all. He arrived at Carl Portelli’s house and rang the doorbell. Carl’s wife, Karen, opened the door. He shot her in the face. Then he marched in and searched for Carl. In an upstairs bedroom he found their seven year old daughter. He shot her in the head. He found Carl hiding in the garage, calling 911. The operator listened as he shot Carl nine times. His next stop was the residence of Ernest Freely. He knocked on the door and though lights were on inside, there was no answer. He walked through the gate on the side of the house and found Ernest and his wife relaxing on the back porch. Before either of them opened their eyes they were dead. A neighbor came outside, responding to the sound of gunshots, and was also killed. For weeks he had been following his wife Doreen to a certain house. He made his way there. Having parked down the street, he walked to the house and began looking into the windows. Several neighbors watched him, but he was oblivious. He walked to the back of the house and found the rear door locked. He kicked the door three times and it caved in, wood splintering and glass shattering. He found them in the upstairs bedroom. The man had a towel wrapped around his waist and was standing with a baseball bat like he was on home plate. Doreen was in the bed with the sheets drawn up to her face, peeking out over her fingers. He shot the man and he collapsed to the floor. He stood over the man and shot him five more times as Doreen watched. He turned the gun on her and could feel his anger turning to humor as he watched her cry. When the sirens were close, he shot her, reloaded, and emptied the gun into her again. He walked back to his car and drove off as the first of the police arrived. Looking at his watch he saw it was still early. Over the course of the next three hours he shot and killed twenty-one more people including two police officers. Several times he left his vehicle and chased down wounded victims. Shortly after midnight, six squad cars had him boxed in on the interstate. He had been riding on flattened tires for twenty miles and the car was falling apart. He was forced to stop. He sat and waited. Around him, the flashing red and blue lights beaming through the dust were almost soothing. They were yelling at him, but he didn’t care. They had their guns pointed. He smiled. In the mirror he saw one of the figures approaching from the back of his car. The rear window shattered in and tear gas filled the vehicle. He’d never experienced tear gas before, though he had wondered if it was as bad as people described it. It was. A hand reached through the shattered back window and unlocked his door. As the door was pulled open, he was blind and ready to pass out, but he managed to raise his gun to his temple and fire. The hands retreated. There was a tense quiet as they waited. Slowly the officers made their way back to the driver’s side, guns drawn and nerves tight. The first officer to reach him kicked his gun away, turned him over and cuffed him, although he knew it wasn’t really necessary. There was a large hole in the side of his head and blood was pouring out as if from a pitcher. “He’s dead,” the first officer said. Their adrenaline was running and they felt frustration as the situation stabilized. Then the long night ahead, hundreds of man-hours spent gathering information. As the sun came up, new officers and staff arrived. The suspect’s car was being scoured for forensic evidence as a tow truck idled nearby. Two of the first responding officers were drinking coffee by the side of the road, getting ready to wrap up their shifts and go home. The soft blue light swam in and out, and it was keeping the pain away. His head hurt, but somehow he was able to insulate himself from it. He imagined himself curled up, floating, up and down gently in soft bubbling noises. He didn’t know exactly who he was or why he was here, but for the moment it seemed he was safe. In an instant the soft blue was gone, replaced by jarring bright lights. He suddenly remembered who he was. Someone slapped his face hard, stars flew into his vision. Now fear was taking hold as he could see he was in danger. The room was well lit and people were standing over him, looking down. The light was obscuring the details of their faces. He first thought, “I’m in a hospital”. His attempt at suicide hadn’t worked. The shot hadn’t done enough damage. This was not what he’d planned. His face was slapped again and one of the figures standing over him, a man, asked him a question. He was quiet, afraid to answer, not even sure if he could speak if he wanted to. His face was slapped again so hard that his ears rang. “Yes, yes, yes! That’s me!” He wanted so badly to put his hands to his face to shield it, but his arms were restrained somehow. “Yes,” he said resignedly. “But I was insane. I want to see my lawyer.” His face was slapped again hard. Tears filled his eyes, burning, but he couldn’t rub them. Horror flooded in. He was in Hell. He’d never believed in the Bible (said he did, but didn’t). Now he saw that it was all true. For a brief second he wondered if maybe this could be Heaven, but he knew it couldn’t be. That wasn’t the place for him. The man standing over him spoke again. “You don’t know where you are. Sometimes people think they’ve gone to an afterlife. Sometimes they think they have gone to heaven or somewhere else. Let me tell you, you are definitely not in heaven.” There was a soft shuffling in the background and he thought he heard people laughing softly. “Oh, God” he screamed. “I’m sorry! I didn’t believe!” He broke down into unintelligible mumbling. “Stop it!” the man said sharply. “God isn’t here and you are not in Hell.” He could hear more chuckling. “You are in our lab. You are our fifth patient. Our techniques are becoming more refined each time.” The man looked up at the others in the room and smiled. Again, there was soft laughter from the shadows. “You look puzzled, Mr. Rames.” More chuckling. “You shot yourself in the head. You put a hole in your brain. You killed yourself.” The man looked around at the others as if they were all in on a joke, from which he was excluded. “Well to tell you the truth,” the man rolled his eyes up and then looked back down, shaking his head slowly. The words seemed surreal to him; he knew what they meant, but it couldn’t be real. He couldn’t be here, strapped to a gurney. His mind was racing. He still didn’t quite understand who they were and what their intentions were. The fear of the unknown was making him feel sick. “We see it happen every year or so, sometimes multiple times a year. Several of us were of a like mind and decided to do something about it. For years we’ve had the ability to do it. Ethical issues clouded us out of using our techniques in the mainstream but we’ve known we could for some time. Unfortunately, at this stage of our research, the results only last a few hours and then your damage returns. So that is why we have to get on with it, quickly.” The man smiled and Rames felt a rushing in his ears as his pulse raced. He was silent, looking up at them. The man smiled and removed a list from his jacket pocket. He unfolded the paper and removed a pistol from another pocket and placed the barrel of the gun to Rames’ head. R. Patrick Widner writes fiction stories based in science. And horror, lots of horror. Alien killers, time-storms, mutated viruses and future cannibals inhabit these worlds. Heroes die, the world is destroyed and everything is not all good in the end. You can find his works at: here (rpatrickwidner.com). 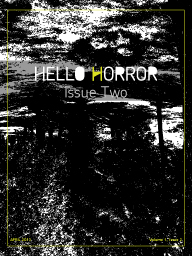 R's story,The Stem Court, appears in the April 2013 issue of HelloHorror.